(that is the meaning of Domus Aurea), located between the Esquiline and Palatine Hills, was one of Nero's most extravagant projects. As everybody knows, two-thirds of the city of Rome were destroyed by a great fire in 64 AD. Nero used most of this land as a site for his new palace. It was not so much a palace as a series of buildings scattered over a landscaped "countryside" which included an artificial lake. The main building was extravagantly crafted, and boasted rooms and hallways decorated almost entirely in gold. 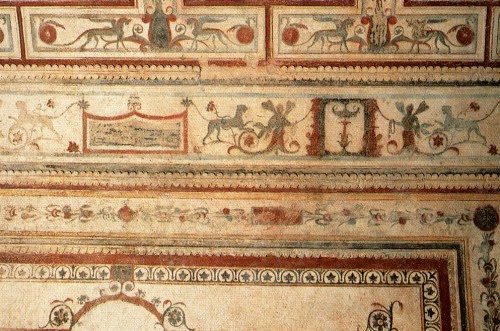 In the case of the Domus, we know the names of the architects in charge of the project, Severus and Celer, and that of Fabullus, the painter who decorated many rooms. One of the most visible (and arrogant) features of the Domus Aurea was the Colossus Neronis: a 36 meter (120 ft) high bronze statue of Nero placed just outside the entrance. This monstrosity was built in imitation of the Colossus of Rhodes, one of the Seven Wonders of the Ancient World. The Colossus was later on affixed with the heads of several emperors, until Hadrian moved it to the Amphitheatrum Flavium (it seems that this could be the origin of the name Colosseum, which started to indicate the amphitheatre in the XI century). The area of the property was 985 feet long by 295 feet in width or depth. Among the other things there was an amphitheatre, a market, and bath-gymnasium complex, served by an aqueduct 75 Km (50 miles) long. Baths were served by a flow of both salted water and sulphurous one from the Albulae springs near Tivoli. Upon the Caelian Hill there were beautiful gardens, zoos, woods and parks where all kinds of animals roamed. There were hundreds of statues, grottoes, fountains, nymphaeums, porticoes painted with romantic landscapes; multiple waterfalls flowed all over. The lake - where the Colosseum was later built - was surrounded by woods and fake sea villages, and it was so big that ships could manoeuvre in it. 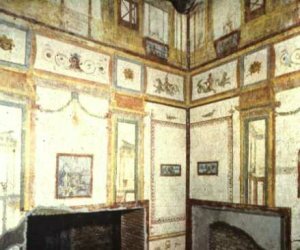 The rooms of the palace were decorated with rare stones and mother of pearl; in the banquet rooms the guests were inundated by flowers and perfumes from the ivory ceilings (R. Lanciani, Rovine...). 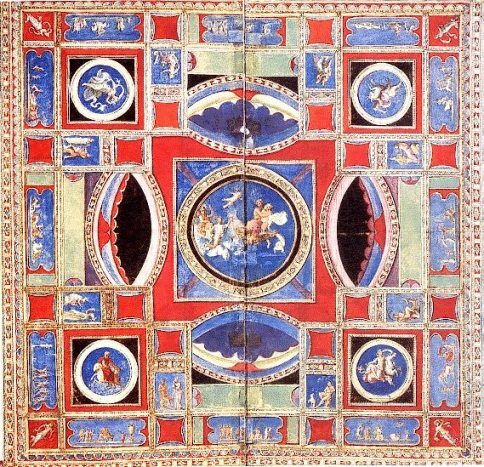 One of the most famous of these rooms featured a circular roof painted with the stars and the planets, that revolved mechanically imitating the movement of the stars. After the death of Nero, Vespasian reopened the property to the public, and the palaces of Nero were destroyed or recycled. 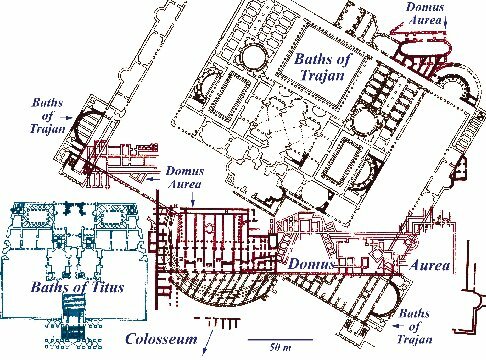 The building we call Domus Aurea was covered by earth and on top of it were built around 80 AD great public baths called the Baths of Titus. Later on, from 104 to 109, Emperor Trajan built another massive complex of baths, dwarfing Titus' complex, the ruins of which can still be seen in the park of Colle Oppio. Enormous foundations were placed in the palace of Nero to support the new buildings, and this also helped to preserve what remained of the Domus. The ruins of the Domus have been rediscovered by the artists in the XV century, and its paintings have been a source of inspiration for many of them (e.g. Raphael in his decoration of the Logge Vaticane), who also left their graffiti on the walls. The Domus Aurea was then called "le grotte", and this seems to be the origin of the term "grottesco" (grotesque) for that particular style of painting. Currently (Jan 2013) the Domus Aurea is closed to the public because of restoration works. The main problems are the water infiltrations from the roofs and the damage caused by the roots of the trees planted in the 30s in the park on top of the ruins. The archaeologists are actually tackling this issues; you can follow the works on this web site (in Italian) . 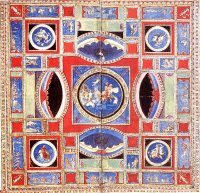 Link to the official site of the Domus Aurea.